Zadig is a tool that allows installing usb drivers on windows without warnings and without the need to restart the computer in maintenance mode. This is the new recomended way to install Crazyradio on windows. First of all download Zadig from its website: http://zadig.akeo.ie/. There is a version for Windows XP and one for vista and later. Plug Crazyradio in the PC. Windows should display some installation window. On windows8 it does nothing and closes itself. On windows 7 you have to close the install failed window. On Windows XP just click “cancel” in the driver install window that should pop-up when connecting the dongle. Et voilà! The driver is now installed and you can use Crazyradio to fly a Crazyflie or else :). 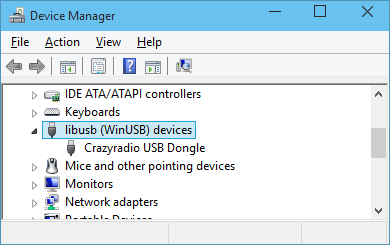 If things does not work check that the Crazyradio appears as a libusb device in the Windows device manager. If it is not the case try to reinstall the driver as described above.